Why is it important to know about the LEP gene (also known as OB or OBS) and leptin? Not only because leptin could be an explanation for part of the obesity epidemic in our country, but also because Leptin supplements are currently a hot topic in the field of weight loss. The vast selection of articles on leptin from popular news sources like the Huffington Post, books like “Leptin Diet (Take Charge),” and the creation of “official” Leptin diets and leptin supplements are all evidence of the buzzword leptin is becoming. As the cultural interest in leptin increases, it is essential that we all know just what it is and how it works, as well as where it comes from. The Leptin protein was first discovered by scientists Douglas Coleman and Jeffery Friedman, for which they received the 2010 Albert Lasker Basic Medical Research Award. Their discovery proved that obesity could actually have a genetic basis, and that weight is not solely controlled by conscious decisions to eat or exercise. The Leptin protein is expressed through leptin receptors, in white adipocytes, a type of fat cell in humans. The protein is also expressed in smaller amounts in the epithelium (a type of tissue) of the stomach and placenta. Leptin is an adipocyte hormone, which informs the brain of appetite and energy levels in the body. Essentially, Leptin is primarily involved in metabolism, energy expenditure and appetite. However, as more studies on Leptin and the LEP gene are performed, scientists are finding an increasing number of other functions and actions in the body that leptin is involved in or has an effect on. When it comes to the energy expenditure cycle, Leptin plays a very large role. Energy expenditure and appetite are both regulated by the Hypothalamus (an area of the brain responsible for body temperature, thirst, hunger, sleep, circadian rhythms, and some parenting/attachment behaviors). 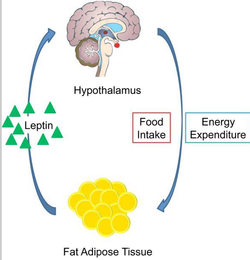 The condition of fat stores in the body controls the production of leptin hormone (leptin levels are proportionate to adipose tissue levels), which in turn communicates to the brain, informing it of appetite and energy levels. When fat levels are low, less leptin is produced, and appetite is increased; when levels are high, leptin is abundant, and appetite is decreased. If there is a deficiency in leptin, appetite will not be decreased, and fat levels will go unregulated, leading to obesity. Mutations in the leptin receptor gene cause obesity and pituitary dysfunction in humans. Leptin deficiency is specifically associated with early-onset obesity, lack of pubertal development, and reduced secretion of both growth hormone and thyrotropin (thyroptin is a thyroid-stimulating hormone; reduced levels can lead to hypothyroidism or Grave’s Disease). In the image at right, we can see a 3-year-old with leptin deficiency who weighs 10kg more than a 7- year-old with normal leptin levels. It is also thought that obesity and predisposition to type II diabetes may be linked to the epigenetic effects of leptin. Certain diets can cause changes in the methlyation of the leptin protein; studies on rats have shown that unhealthy diets caused lower levels of leptin (in turn leading to obesity and other health issues) and high-protein diets did the opposite. Other studies have shown that a mother's diet during pregnancy can effect the leptin levels and leptin functions of her child, and therefore effect their predisposition to obesity, diabetes, and other diseases caused by abnormal leptin levels. Because Leptin has been found to be involved in obesity and diabetes, there is currently research being conducted on rats to see whether Leptin gene therapy could be used as a cure to diabetes. Most recent results indicate that Central Leptin Gene Therapy blocks obesity and diabetes brought on by diets; essentially, these results indicate that not only people with genetic Leptin deficiencies can be helped by gene therapy, but obese people who are obese at the hands of their environment. The LEP gene is located on chromosome 7 at position 31.3, specifically between base pair 128,241,188 and 128,257,628. The LEP gene has two distinct introns that are identical in every instance of the gene and follow the consensual gt-ag/gu-ag rule (meaning it begins with gt and ends with ag). Beyond these distinct introns, the gene has at least 2 alternative exons and 1 alternative intron, meaning it can be spliced in different ways. 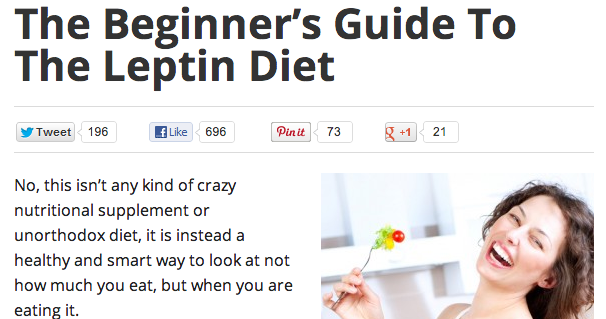 Leptin commonly interacts with ghrelin, a hormone used in regulating and causing hunger. The hormone also slows down the metabolism as an evolutionary safeguard for the c﻿ase that a hungry human does not find the food it wants. Studies have found that leptin may regulate levels of ghrelin. Another study on the interactions between leptin and ghrelin also found that they play a role in the energy requirements of pregnancy; it concluded that "Leptin and ghrelin and other adipose tissue-secreted hormones have significant effects on reproduction. Acting through the brain, these hormones may serve as links between adipose tissue and the reproductive system to supply and regulate energy needs for normal reproduction and pregnancy." Studies of leptin's role in fish, reptiles and mammals have concluded that leptin performs the same role in all vertebrate species, suggesting that leptin's role in the body was determined long, long ago and has since been conserved.